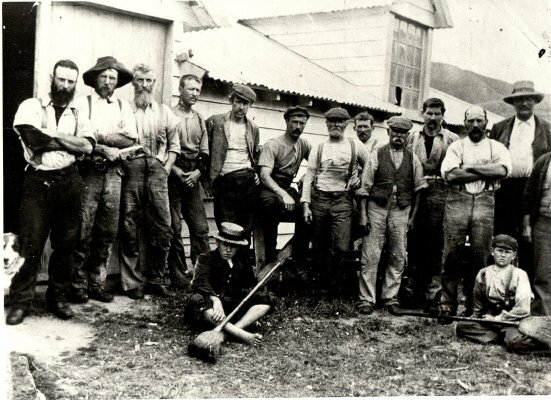 Description A black and white photograph of a large shearing gang in front of a building with a broken windowpane. Information as typed by Norm Brayshaw: "A Shearing Gang. Left to right: Walter Millard; J. McIsaac; H. Gee; G. Hughes; Ted Gibson; Bob Gillan; Andrew Henderson; Len Wilkin; M. Kelly; R. Herd; Tom Gleeson; Alick Mowat. [Boys] In front D. Chisnall; K. Thoms." Added in pencil by Lloyd Kerr, "Lansdowne Run". Copied by Norm Brayshaw in 1961 from a photograph held by Mr. J.R. Mawson, Brewer Street, Blenheim. Includes a negative.